Over the last week I have published a series of blogs about the costs of Barnet's contract with Capita. I am a regular attendee at the Performance & Contract Management Committee meetings where I have consistently raised concerns about the performance of Capita and the costs we are paying. There is an equally consistent approach by Conservative Councillors who always say everything is fine and dandy, which I find both frustrating and worrying given that there is no rigorous challenge. Barnet’s services for children were inspected by Ofsted in April and May 2017. They were found to be inadequate across all reported categories. The inspection raised serious questions surrounding the quality of practice and leadership, including the Borough’s focus on children, its quality assurance systems and the quality of management oversight. The Barnet Safeguarding Children Board (BSCB) was also found to be inadequate. As a result, an independent Children's Commissioner was appointed by the Secretary of State and is required to report to the Minister of State for Children & Families - so pretty serious stuff. The report looks into the underlying problems that brought about the failure and what barriers are preventing the service from improving quickly. Problems had been identified in 2016 and experts from Essex County Council brought in to advise Barnet but a year later when OFSTED inspected many of the problems still existed. The lack of ‘turn-around’ leadership experience and expertise presents the clearest barrier to improvement in Barnet. It has led to a lack of clarity, inconsistency and poor engagement in terms of setting expectations around practice standards and protocols across children's social care services. A robust, inclusive Improvement Board was needed, supported by a structure which ensures actions are taken and monitored. The Improvement Board in operation was an internal Board, chaired by the Chief Executive which met too infrequently to impact on practice and received over-optimistic and unspecific reports on progress. Silo working was pervasive throughout the Council. While lack of ‘join up’ is often seen in large organisations, the silos found in Barnet at the corporate level mitigated against the potential of SCB to make a strong contribution to support the improvement for children. Equally, silos across children’s services and partners more generally, including between safeguarding and education services, did not maximise improvement capacity. There are some cultural issues to be addressed at the corporate level which may relate to the legacy of the commissioning/delivery split. Because the focus of SCB had become higher level transformational and strategic change issues, day to day ‘business as usual’ matters began to be seen as less important and were not normally discussed at top level. The Council is a process-heavy organisation with multiple approval requirements for even fairly straightforward matters. This leads to frustrations and delays which mitigate against establishing a nimble and creative improvement culture. While many within the service were acutely aware of the failings described by Ofsted, both before and after the inspection, there was a general lack of in-depth understanding elsewhere. Prior to the inspection, this was exacerbated by over-optimistic reporting of progress, including to the Improvement Board, and by inaccurate information arising from audits and quality assurance processes. While there is a clear understanding about the importance of using performance and management information to drive improvement and monitor impact for children, systems and approaches are poor. This represents a distinct barrier to further improvement and is also a contributory factor as to why the impact of improvement activity since 2016 has not been sufficient. There are significant amounts of data and information about performance within the borough but analysis and use of that data and information are under-developed. Monitoring has tended to focus on quantitative indicators without significant reference to the quality of practice and the impact on children. There is a serious disconnect between senior managers in children's social care and the front line. This is a significant barrier to improvement and also a core reason for the lack of impact of improvement efforts so far. The lack of purposeful and systematic engagement with staff in Barnet leads to a lack of clarity and understanding about what is required of them. Equally, staff do not feel that they have the opportunity to contribute their expertise to developments – they are ‘receivers’ of change rather than agents of change. Many staff report frustration about the lack of follow-up when suggestions or requests are made. It became clear that governance in Barnet has not been sufficiently focused on safeguarding children. Most members did not have a good understanding of safeguarding issues; of safeguarding work in the borough; of the needs of vulnerable children in the borough; and, significantly, of the problems growing in the service and the implications for children of the findings highlighted in the recent Ofsted inspection. Following the serious issues raised in the Essex report in March 2016, bilateral discussions were had between the DCS and individual members. The Leader and Lead member (Chair of CELS) were well briefed by the DCS on concerns raised, and the restructuring took place to give the DCS full responsibility and accountability for the service, as outlined in paragraph 2.6. However, the CELS Committee did not receive any reports relating to concerns highlighted in the Essex work. why the culture in Barnet leads to over-optimistic and over-reassuring reporting to members. This may be due to factors such as the marginal nature of the borough’s politics; the concern to maintain Barnet’s reputation; custom and practice; and/or a misplaced concern to make serious safeguarding issues public prior to an Ofsted inspection. The Director for Social Care and Education at Essex County Council, will remain the Chair of the London Borough of Barnet’s Improvement Board, and report progress on a regular basis to the DfE. Barnet cannot be trusted to fulfil this key role. The last three points are indicative of wider problems at Barnet; is the committee structure appropriate to adequately scrutinise the performance of the Council? The split between the theme committees and the performance committee is an issue I have highlighted repeatedly. It is akin to two people driving a car, one holding the steering wheel and someone else operating the accelerator and brakes. Critically, the issue of over optimistic reporting to save face is something I experience regularly in Barnet. This all has to end if we are not to see similar problems arising in other parts of the council. We need a change of administration and a complete rethink on the way the council is run. 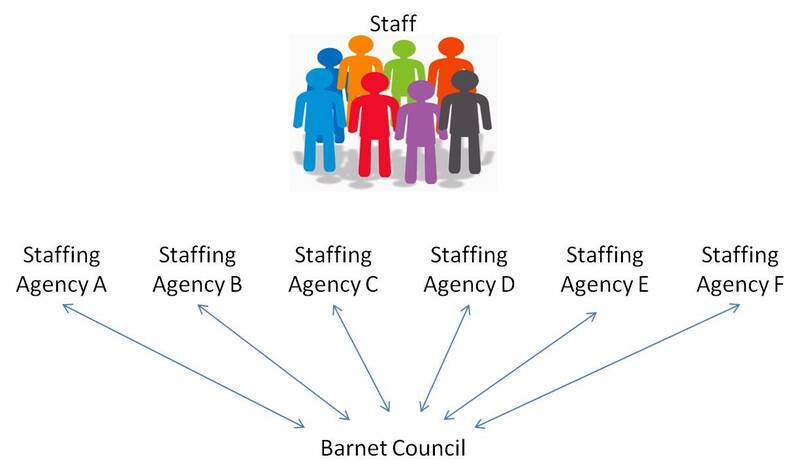 This would involve Barnet dealing with lots of staffing agencies separately and paying bills from each agency. Barnet would also need to negotiate commission rates with each agency separately, which is a time consuming and complex task. 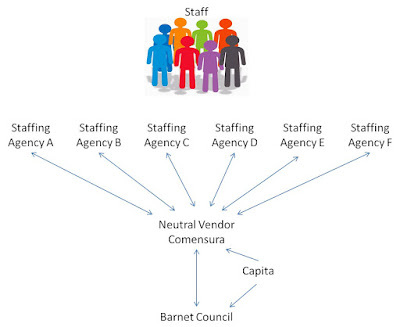 To overcome this problem many public sector organisations use what is called a neutral vendor. 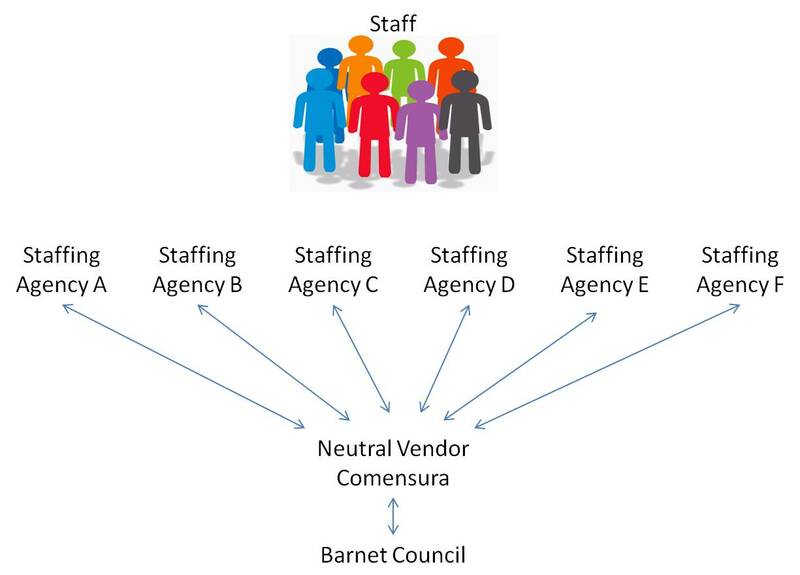 In Barnet that neutral vendor is a company called Comensura. They do not supply any agency or interim staff themselves, they simply act as a consolidator, collating and managing the relationship between staff agencies and the Council. Comensura negotiate rates and charges with agencies. The original contract with Comensura was agreed at Cabinet Resources Committee on 20 June 2012 and started on 1 October 2012 for a period of three years with the option to extend for a further year. 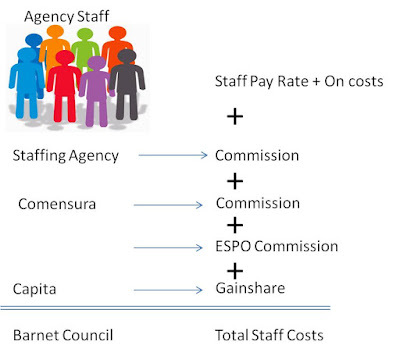 It was sourced through the Eastern Shires Purchasing Organisation on a framework contract (one that has already been agreed) and ESPO take a small commission on every hour of agency staff used. In September 2015 approval was given to extend the contract for one year to enable preparation for, and procurement of, new contract arrangements for temporary workforce provision. A year later, in September 2016, approval was given for a further two year extension due to the failure to secure a new contract in collaboration with a number of London Councils. In the original tender process, a tender price was submitted by Comensura but the following statement was made at point 9.10 in the tender evaluation report. “Each of the bidders has identified but is not able to quantify additional cash savings that could be achieved during the implementation phase of the contract when further pay rate benchmarking will be carried out and the baseline value of the contract has been set by Comensura. “Comensura and the procurement team have identified short term additional savings benefits in year by reviewing long tenure agency employees; those engaged for longer than 3 months a year on short term contracts and are working towards a reduction of these”. This was also driven by a change in HMRC rules to stop agency staff avoiding tax and national insurance. Hopefully all is clear up to now. Now we get to the main issue. As soon as Capita took over the CSG contract they claimed a gainshare on this Comensura contract. 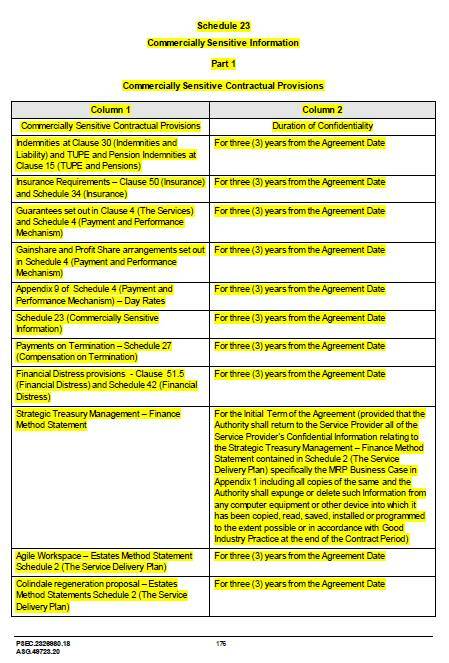 Since 2013 Capita have claimed several millions (I estimate c.£3 million) in gainshare payments on this contract. Fundamental to Capita’s gainshare claim that they “negotiated” further savings is whether these were in addition to the savings identified but not quantified or simply a quantification of the savings that Comensura had already identified or that Comensura subsequently generated. This is a critical point as the majority of gainshare payments made to Capita relate to this one contract. I have asked for the evidence that Capita did generate these savings but this has not been provided. 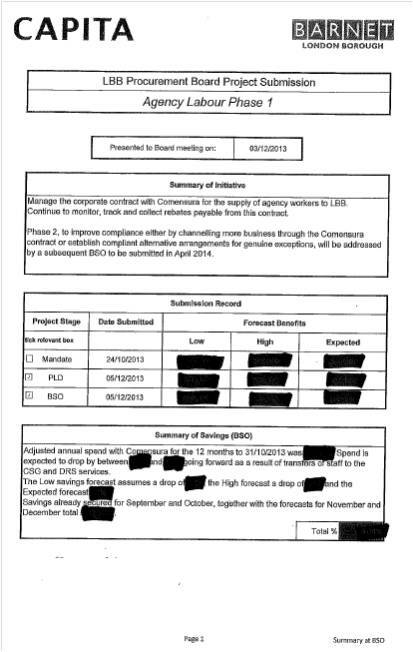 I have received a redacted copy of the original LBB Procurement Board Project Submission (attached below) but this merely serves to question whether the savings have been realised given that the cost of contract has risen from £12.53 million in 2012/13 to £19.88 million in 2016/17. Under the terms of the original Comensura contract it was let for a three year term with the option to extend for one year only. As I see it, the latest contract extension in September 2016 cannot be an extension, it must be a new contract. As such, even if the gainshare payments on the original contract were valid, which I do not believe they were, I do not see how they can be extended to the new contract commencing in September 2016. However, Capita are claiming gainshare for the entire financial year to March 2017. 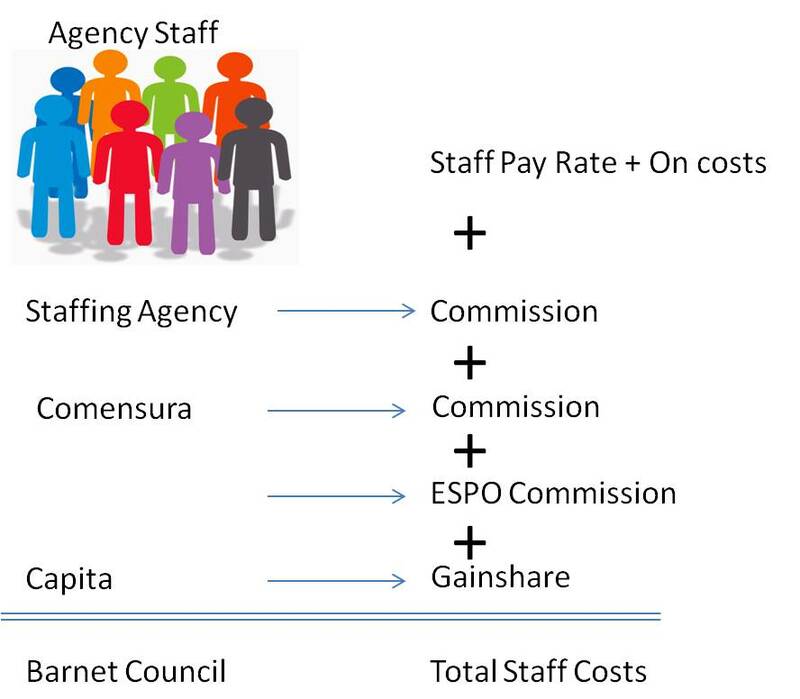 Overall, we are paying commission to four different organisations between the wages and on costs of the staff member and what Barnet Council finally pays. Now I don't know how much negotiation took place, whether the savings are real or not but this gainshare has been a massive money spinner for Capita. The gainshare they have claimed could, for example, have been enough to offset all of the library cuts. 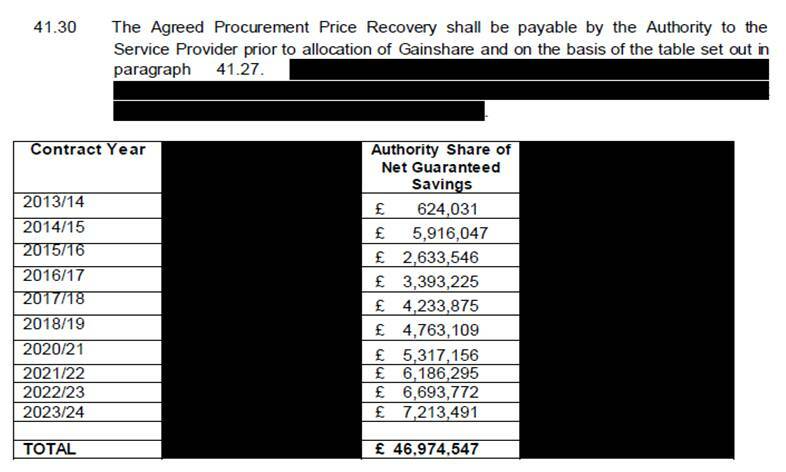 As with the other contract gainshare examples I have raised in the last three days, by claiming large savings, it triggers the ability for Capita to claim the Agreed Procurement Price Recovery Payment (APPR) which this year was £970,000. I have been prevented from seeing what the APPR was in the three previous years of the contract but is likely to be as much or more than this year's payment. Again, I raised this with the external auditor back in July last year but six months later have still not received a response. I raise this because, at a time when the council are consulting on further budget cuts, Barnet are writing out very large cheques to Capita under this catch-all gainshare clause. It shocks me that the council are happy to cut vital services but aren't prepared to challenge Capita on this matter, but that is the Barnet way. Back in 2015 a report was presented to the Policy & Resources Committee regarding potential savings on energy costs. The report was authored by the Council's Commercial and Customer Services Director, a Council employee (not Capita) and who has subsequently left the Council. The report highlighted an energy review which had been undertaken to inform options for procuring energy for the Council. The energy review was undertaken following receipt of London Energy Project’s (LEP) benchmarking update on energy provision which compared energy arrangements delivery by LASER and Crown Commercial Services. Just to be clear LEP is a London Councils initiative of which Barnet is a member. The review informed the options for procuring energy going forward and these are presented both within this report and in the supporting Energy Review Business Case. The report was considered some way in advance of the new contract commencing, as advance commitment had to be given to "enable the opportunity of forward purchase of energy during optimal market conditions." So just to be clear, this was a report presented by a Council employee, based on a benchmarking update from the London Energy Project for energy delivered by LASER Energy which is a wholly owned subsidiary of Kent County Council and an organisation from which Barnet has been buying energy since 1993. The report also notes that alternative options were considered but were not recommended as "these would represent an approach which does not conform to the Pan Government Energy Project recommendation that all Public Sector organisations adopt aggregated, flexible and risk managed energy procurement." So this was pretty much the only option. The report identified that the new contract would save around £110,000 a year on energy costs. In addition, by opting for a fully managed contract, the report said that the service would avoid certain costs, the largest of which is correcting overcharges. Personally, I find this implausible because if the procurement department were doing their job there should not be £202,000 of overcharges and ultimately they get corrected. I also do not believe that you can forecast those cost avoidances going forward as surely mistakes would not continue to be repeated year in year out? Nevertheless it can be an indicator a fully managed service might be a better option. I have subsequently identified that this fully managed service comes at a cost and is reflected in the price LASER charge for energy, typically 1.5% of energy usage. The report was signed off and the new contract commenced in October 2016. So far so good. As part of my review of all Capita invoices, I was therefore surprised to come across this invoice claiming a gainshare of £357,701.51 of which £313,215 is for making savings on the energy contract of £942,000. So what Capita are claiming under gainshare is not only the energy saving for three years but also costs avoided for three years, a service provided by LASER and for which Barnet pay LASER a fee of approximately 1.5%. In total they are claiming a saving of £942,000, yet from what I can see Capita had no input to the generation of this saving and have used theoretical potential cost avoidance, which we pay another provider for, to arrive at an inflated figure of which they want 33.25%. That is, to my mind, is not acceptable, does not represent a fair and reasonable interpretation of the gainshare clause and should not have been signed off by the person who authorised this payment. What I also find interesting is that Harrow Council, who provide legal services for Barnet, also went through a similar process in 2015. They came to a similar conclusion (with a couple of variations for renewal energy and low energy use sites). You can read their report here. Could we have had a chat with Harrow and made the same savings without any charge from Capita? Be aware that by claiming an overall saving of £942,000, it means that Capita can claim to have met their guaranteed procurement saving and bill Barnet the £970,000 Agree Procurement Price Recovery. Yet again this has a very bad odour about it and makes me question the whole gainshare arrangement. I raised this matter with the external auditor, BDO, as an objection to the accounts back in July 2017 but six months on BDO have still to provide a response. I remain concerned that no one has a grip on what we are paying Capita through this money spinner gainshare clause, that Barnet are being right royally ripped off, and that councillors are blissfully unaware. In Barnet we have two contracts with Capita: one for the CSG contract and a joint venture for regulatory services known as Re. Under the CSG contract Capita can claim a gainshare payment for savings they make on procurement contracts or from existing contractors. 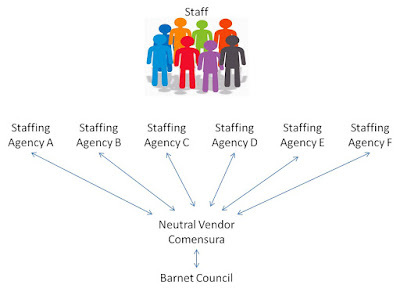 The Re contract is structured in a completely different way, being a joint venture between Barnet Council and Capita and as such there is no gainshare clause within that contract. As part of the inspection of the accounts I have gone through all 224 Capita and Re invoices and all the supporting information, a thick arch lever file's worth, and have discovered a number of issues. One in particular is set out below. As part of the Re contract Capita are responsible for highways. 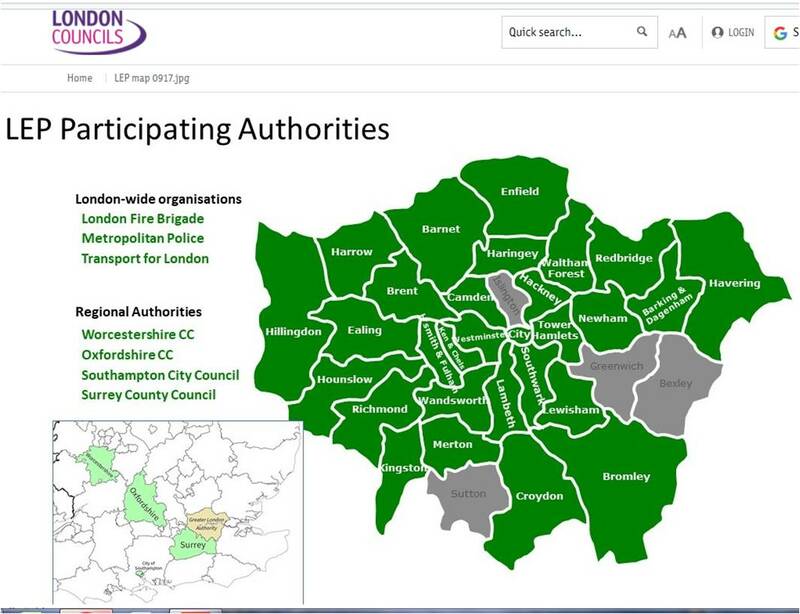 This is also one of the areas where Barnet collaborates with other London Councils on something known as the London Highways Alliance Contract (LOHAC). You can read more about it here. On 9 May 2016 Re submitted an invoice to Barnet for the sum of £365,088.67 +VAT for LOHAC Procurement Support. I'm not sure specifically what they did for that very large amount of money, but it should have bought a great deal of support on what is a framework contract. Barnet duly paid the invoice. 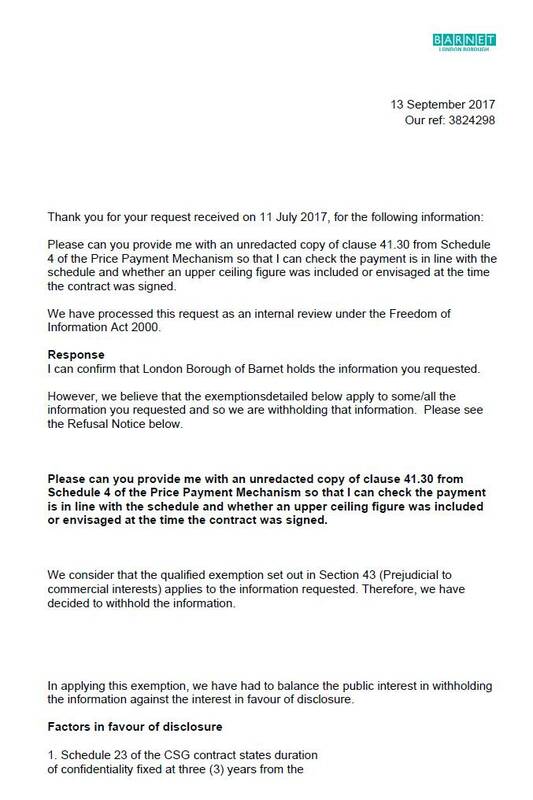 Five months later, on 7 October 2016 Capita CSG, the other arm of Capita in Barnet, submitted an invoice for a gainshare payment of £484,375 for saving made on the, wait for it, LOHAC procurement contract. So one side of Capita appears to be getting paid for providing procurement support and then the other side of Capita claims the gainshare savings on the same contract. That, I believe, is known as "double bubble". Because the claimed savings on the LOHAC contract are so large it means that Capita have met the guaranteed savings level and can claim their £970,000 Agreed Procurement Price Recovery (APPR) fee. If this turns out to be a mistaken claim then not only would the £484,385 have to be refunded but also some or all of the £970,000 APPR fee. In total we are talking just shy of £1.5 million so not chicken feed. Now it may be that there is an innocent and entirely plausible reason for both Capita contracts being paid for the procurement savings on the same contract but having raised it with the Chief Executive, the Council Leader, and the external auditor no one have so far responded. What worries me is that I seem to be the only person looking at all of the Capita invoices in any great detail. It also worries me that the finance function of the council is run by Capita who not only raise the bills but pay the bills. That just seems inappropriate to me. I have lost all confidence in the Capita run finance function, especially after the year end audit debacle where the year end accounts were delayed and Capita were fined £55,000 which you can read about here. At the time I suggested that the finance function of the council be brought back in house. Given all the concerns I have seen as part of my inspection of the accounts, my view hasn't changed. When Barnet signed up for the outsourcing contract with Capita it was claimed that there would be lots of savings. As anyone with an ounce of sense knows, something that sounds too good to be true usually is. At the time the contract was signed most people, including many councillors, were in the dark as to the details of the contract because it was "commercially sensitive". "The CSG contract includes within it investment into the procurement service by means of subject matter experts that aid in delivering the guaranteed procurement saving. This investment is self financed through savings generated over and above the guaranteed position to the council". However, if Capita don't achieve enough saving to cover the minimum guarantee to Barnet and the Agreed Procurement Price Recovery, they can roll over their APPR share and claim it back the following year. The procurement savings claimed are large, although some may be surprised just what they claim savings on. 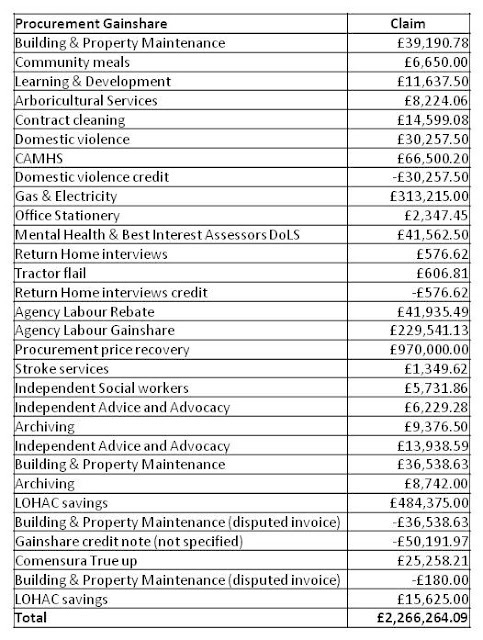 Below is a list of the procurement gainshare paid to Capita last financial year. I would note that the claimed savings as reported in the accounts do not appear to coincide with the invoices provided by Capita for the claimed savings and, as such, gainshare payments. What is noticeable is that Capita are claiming gainshare on vital services such as Domestic Violence, Children's and Adolescent Mental Health Services (CAMHS), Stroke Services and Return Home Interviews to name just a few. 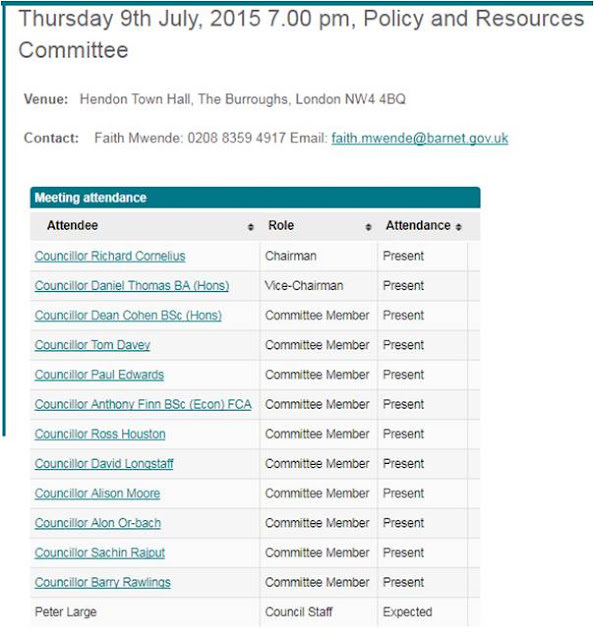 What is also interesting is that a number of these payments were subsequently credited back to Barnet as they were not substantiated. What worries me is that Capita are trying to make money from vital services which must be considered in terms of the QUALITY of the service not just the COST of the service. It would also be interesting to understand to what extent this process is tying up council staff trying to assess whether these savings have actually been delivered given a number have been rejected. Be under no illusion, gainshare is very profitable for Capita and, as I understand it, is included in a number of their other contracts. However, should we, in Barnet, be hanging on to more of those savings, if they actually exist at all. I have asked this of Conservative councillors on a number of occasions where their view is "it is better to have two thirds of something than 100% of nothing". While there is a logic to that statement, it is of course not comparing like for like. 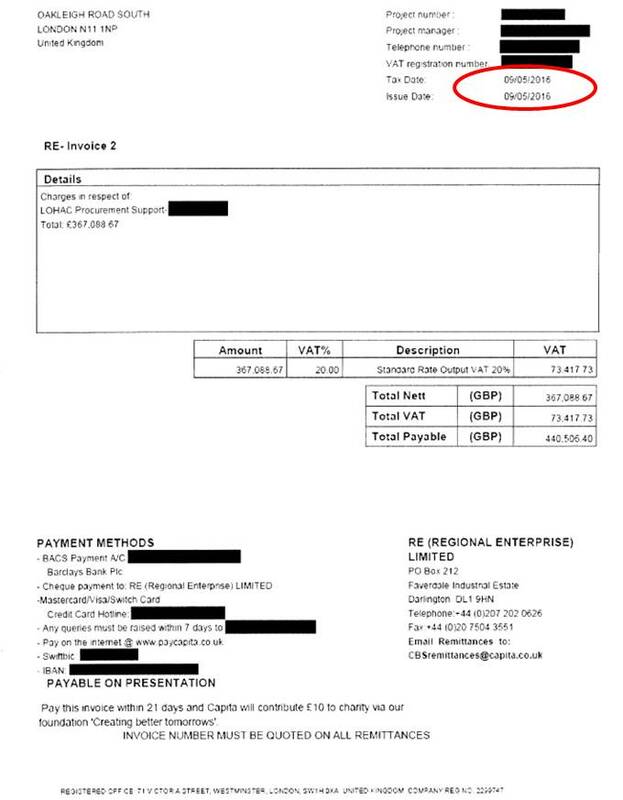 This year alone we paid Capita a guaranteed payment of £970,000 for their procurement "subject matter experts". This is on top of the standard contract fee we pay them for managing the day to day procurement function that is part of the CSG contract. Based on many year's experience in business there are always some "low hanging fruit" or easy wins to be gained whether that is sales, savings, or service changes. If you are the client, what you want the contractor to do is actually look at the tougher areas where savings, sales or service changes are harder to realise. As such you would typically incentivise the contract so that on the first slug of changes generate minimal benefits for the contractor but once they have over come that threshold they then start to benefit. My view is that if Barnet were serious about procurement savings they could employ a red hot Head of Procurement on £100,000, which seems a pretty competitive salary if you look at current vacancies on Indeed. Give them an assistant manager and an admin person and that comes to no more than £200k per annum including on costs. Capita only addressed 21 procurement items during the year 2016/17 and a number of those, such as building maintenance and agency staff, had been agreed in previous years, so the workload isn't huge. That way we spend £200k but save £770k on the Agreed Procurement Price Recovery payment and keep 100% of the other procurement savings rather than handing over a third to Capita. It makes sense to me but why don't Councillors see it the same way? I will be looking into the gainshare deal in more detail in a series of blogs in the coming days so please keep following. Before the CSG contract with Capita was signed, Councillor Hugh Rayner made a very insightful observation which, thanks to the sadly missed, Dan Hope, we can still see below. Cllr Rayner made the observation that in many contracts the profit is made in the "extras". As part of my inspection of Barnet's accounts, I have analysed all of the invoices and the supporting data to compile a list of all the extras, contract variations and special projects which Barnet have paid Capita to carry out on their behalf. In terms of contract variations and extras there have been a number including routing library calls through the Capita call centre. Apparently this was omitted from the original contract so as a result we were charged £453,580 for that service in the first two years of the contract. I did some analysis of call volumes and by my reckoning it worked out at a charge of just over £8 per call. 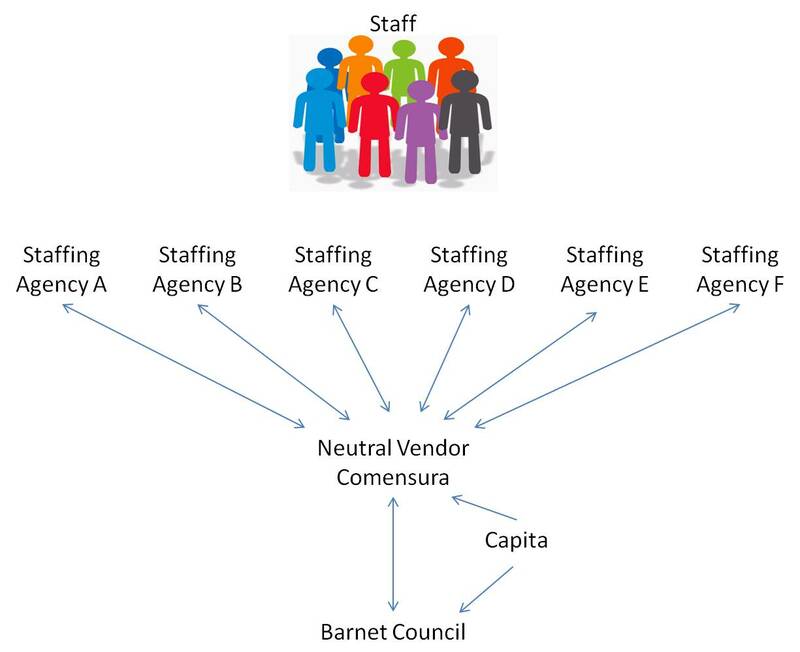 In the most recent contract variations schedule Barnet agreed to move the Single Fraud Investigation Service (SFIS) from the council's own staff in the Corporate Anti Fraud Team (CAFT) to Capita's CSG Revenues and Benefits team. That means an additional charge by Capita of £112,291. Whether we will save £112k of salaries by reducing the CAFT is a moot point. Also Capita have been given the task of administering the Barnet Crisis Fund. Again this will be undertaken by the CSG Revenues and Benefits (Revs & Bens) team as a cost of £449,166.67. (You can read them both here at page 85). Update 13 July 2018 - welcome Guardian Readers have a look at some of the findings from the most recent accounts - there are some real shockers here, here, here and here. One might suspect that the Revs & Bens team have got plenty of spare time on their hands to be able to take on this extra work. 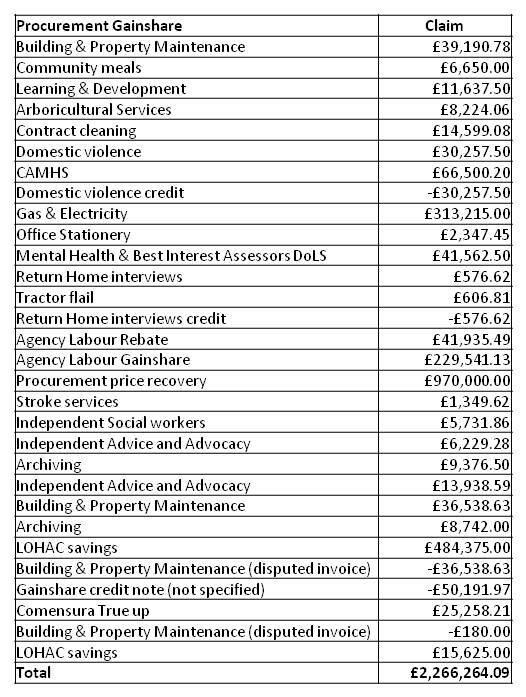 Yet trawling through the Capita invoices for 2016-17 I see that Capita charged Barnet an extra £330,228 for the extra workload above the agreed contract thresholds plus an extra £98,039 for "face to face" support. We also had to pay an extra £14,400 for 12 executive coaching sessions provided by a subsidiary of Capita to senior council officers. One invoice mentions the name of the recipient of 6 of those coaching sessions but I will spare their blushes here. However, paying Capita £1,200 per coaching session seems quite lucrative to me. So now we move on to special projects. 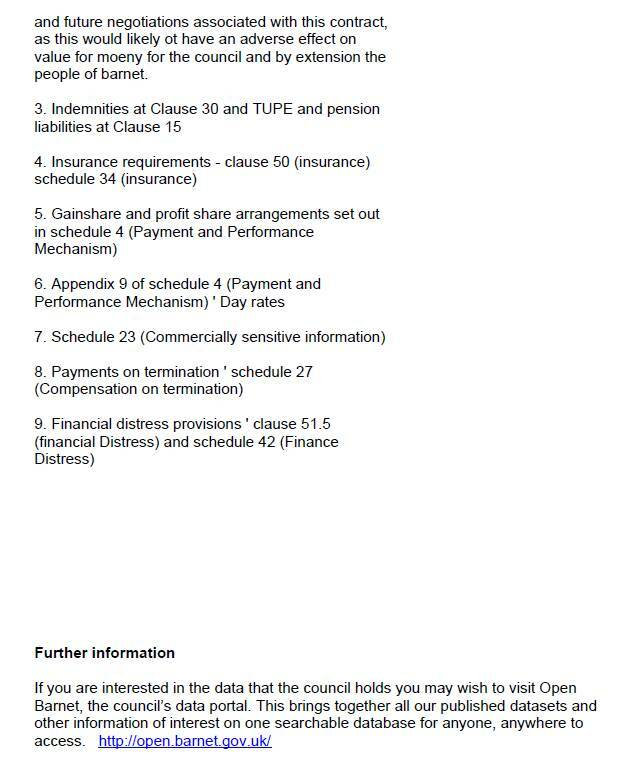 These are items that weren't included in the original contract and for which we pay Capita at pre agreed consultancy day rates. We don't know what those day rates are because this is one of the items Barnet/Capita want to remain secret even though both parties agreed in the contract they would be disclosed after three years (see my previous blog). To be clear, these charges are just for Capita's input at pre-agreed consultancy rates. While some of the projects may have always required external support, there are some which in the past may have been able to be carried out by council officers within their normal duties. This was confirmed by an officer when I asked the question a a committee meeting. Grant Thornton also commented, "Our benchmarking identified that a clearer understanding would be achieved if margins and costs were considered in relation to prices charged for service delivery". So the answer is we don't know. A few highlights from special projects list below include: £248,000 for Family Services Recruitment, £1.4 million for work on the libraries downsizing, £1.52 million on project managers, £895,000 for Greenspaces support. Some, many or all may be perfectly legitimate but without a doubt this is a significant money earner for Capita. So my question is are we being ripped off on any of these projects and are they really saving us money? I think Cllr Rayner was right on this one. Secrecy can be a nasty practice with people often keeping secrets for all the wrong reasons. Secrets breed mistrust. In Barnet, the Capita CSG contract has many secrets. The polite, business-like term is "Commercial Sensitivity" but we all know it is secrecy. Barnet say they want to create a sense of transparency and trust but as the saying goes "never give out all the information". When Barnet entered into their contracts with Capita back in 2013, I, the other bloggers and local residents spent much time asking for the contracts to be made available so we could see what Barnet had signed up to. Richard Cornelius trumpeted about all of the thousands of pages of contract that were available but unsurprisingly there were some elements, the really important elements of the contract, that remained secret. When the contract was first signed we weren't even allowed to know what was being kept secret. Chunks of text were completely redacted, with an explanation that we didn't need to know because it was commercially sensitive. There was also a patronising undertone of "why bother our silly heads with all this complicated contract stuff. The Councillors know best, just accept it". I have read the contract, the many contract clauses, contract schedules, method statements and contract commitments, but the really important stuff, like money, has always remained secret. I regularly revisit the contract and came across a schedule that had been originally redacted in full, Schedule 23 Commercial Sensitivity. In this schedule, it sets out the duration of the confidentiality; for some items it is the term of the contract, i.e. 10 years, but for a number of items the duration is only three years. Most years I take up every residents' legal right to inspect the accounts and, as in previous years, this year I asked to review all of the Capita invoices paid by Barnet. I will publish further blogs over the next week on some of the other matters I came across, but suffice it to say, there was one particular issue relating to the gainshare clause in the contract that I wanted more detail on. For those not in the know, "gainshare" is a mechanism by which Capita can claim a proportion of savings they make on behalf of the council. The percentage varies but it is typically 33%. What is also important to understand is that the savings Capita claim are not retrospective but future savings paid up by Barnet in advance. At the year end they have what they call a "true-up" process where they look back to see if they really have made those savings. If the savings are greater then Barnet pays more, if the savings are less Capita make a refund. Not an ideal situation, but that what was agreed in the contract. This year Barnet made a one off payment to Capita of £970,000 on top of the usual gainshare payments. 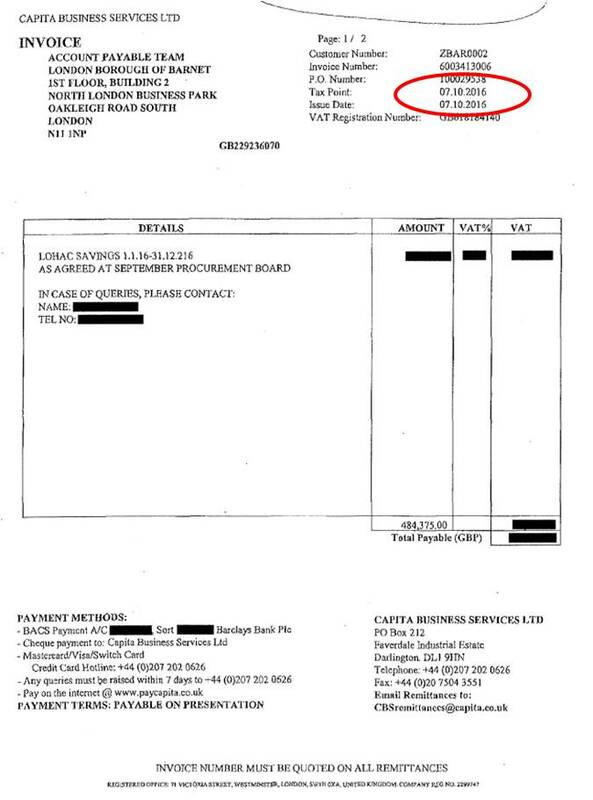 Having challenged this payment I was told that it is something called the Agreed Procurement Price Recovery and yes it was in the contract (Schedule 4) but that clause is redacted. I wanted to check to make sure Capita hadn't been paid excessively and to understand what we have automatically paid in the past and what the payments will be in the future. £970,000 is a very substantial sum, not small change, so I think it is important that should be aware. Set out below is the clause in its fully redacted state. Having read in Schedule 23 that the gainshare and profit share arrangements are only confidential for the first three years of the contract, I obviously asked for an unredacted version. I also asked for a number of other clauses identified in Schedule 23 that are time expired to also be disclosed. Now just for clarification this is something written into a contract which both Barnet and Capita have signed. So there you have it, Capita did agree to make this information available when they signed the contract but what I have asked for is now so dangerous that it could lead to financial problems for the £2.3 billion market cap Capita PLC and lead to job losses. Bear in mind this was before the Carillion collapse. Even so, I don't know who they are trying to fool but I think disclosing a single set of figures to me is the least of their problems. What is also important to note is that they want to make all of the information in Schedule 23 exempt including Schedule 23 itself, which has already been disclosed. This has a Stalinist feel to it - we must forget the information we already know as it will be an offence to remember it in the future. This is what we have come to in Barnet. A Council that kowtows to its supplier Capita, a Council that talks about transparency but does its utmost to prevent it. A Council that puts the commercial interests of a private company above the interests of its own residents. The matter is now with the Information Commissioners Office. We will have to see what they say, but if ever there was a time to be transparent about what a Council has signed up to, it is now. It is vital that we can understand what this private company is being paid and to make an assessment of whether it is value for money. Update: I have just received notice that the Information Commissioner's Office that they have upheld my request for disclosure of the Capita Day Rates. I have also now received details of the contract termination terms, the gainshare payments and the Agree Procurement Price Recovery payments for the 10 years of the contract. At least we can now have some transparency as to what we are paying in extras to Capita. Watch out for more blogs over the next week on the lamentable state of Barnet's contract with Capita.